The rooms used by the SCR are on the first floor of Keele Hall. They comprise the University Common Room, the Breakfast Room, and the SCR Bar. 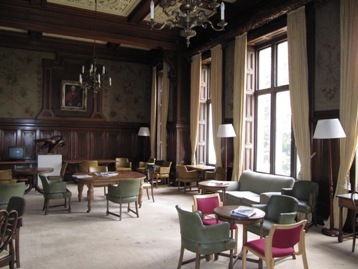 The Common Room and the Breakfast Room are open during times when Keele Hall is open, generally 8.00 am to 8.00 pm on weekdays: at other times the rooms will be locked. Retired members without Keele Cards may obtain one by calling at the IT Service Desk in the IC1 Building, where they will be requested to complete an application form. The card will be issued after the application has been checked against the SCR Membership List. As these cards are unique to the user and also provide the opportunity for cashless trading in the other catering and bar facilities on campus they are non returnable and therefore, on application, such members will be asked for a signing up fee of 5 pounds payable to the University. There is a wide screen TV and Freesat box in the Bar. The SCR used to subscribes to a range of newspapers, available to members in the Common Room. It is with regret that the Committee decided to cancel these subscriptions; due to falling demand in an age when news is readily found from other sources, they had become a disproportionate burden on the SCR's finances. This change was effective from October 2014. A notice board in the Breakfast Room displays current notices, including bookings of the rooms; members wishing to place personal or other notices on the board should send them to the Secretary, or one of the other Committee members. Notices are generally left for a month. Notices also appear on the SCR website and may be placed there by arrangement with Stephen Clifford. From 1st August 2017 the rooms of the SCR, other than the Bar, are managed by University Catering and Conferences. Bookings of the rooms should be made through Conferences and Events, for functions of an academic nature, or which otherwise reflect to the interest of the SCR or University. The normal rate is 44 pounds for an internal booking, but Members have the right to request special arrangements to reflect their former entitlement to book the rooms at reduced rates. The SCR is unable to provide catering for events in the rooms, or the Bar, where in Bar opening hours there is a menu provided by University Catering. The SCR Wine Stewards are of course always happy to provide wines and glasses for members' events, and sale or return terms can be agreed. From September 2017 the piano also is bookable through Conferences & Events, which has agreed to pay an annual sum to the SCR in lieu of hire fees. Members wishing to hire it for an event should mention that they are members when booking the piano.